Why is your door stuck shut? Let's find out. It can be pretty embarrassing having to climb in and out of your truck through the passenger door. Maybe your locks are stuck in the "lock" position, or you pull the handle and nothing happens. There are a lot of things that can go wrong with the door mechanisms, so let's see what we can do about them. If you can open the door from either the inside or outside but not both, go to Step 1. If you can't open the door at all, then start from Step 2. You may have a damaged or disconnected door handle rod. You will need to remove the door panel to check. Remove the door panel. You will need a trim panel removal tool and a screwdriver. Look for anything that may be disconnected, especially the long rod that operates the handle mechanism. If the rod is broken, it will need to be replaced. If the rod is disconnected, reconnect it. 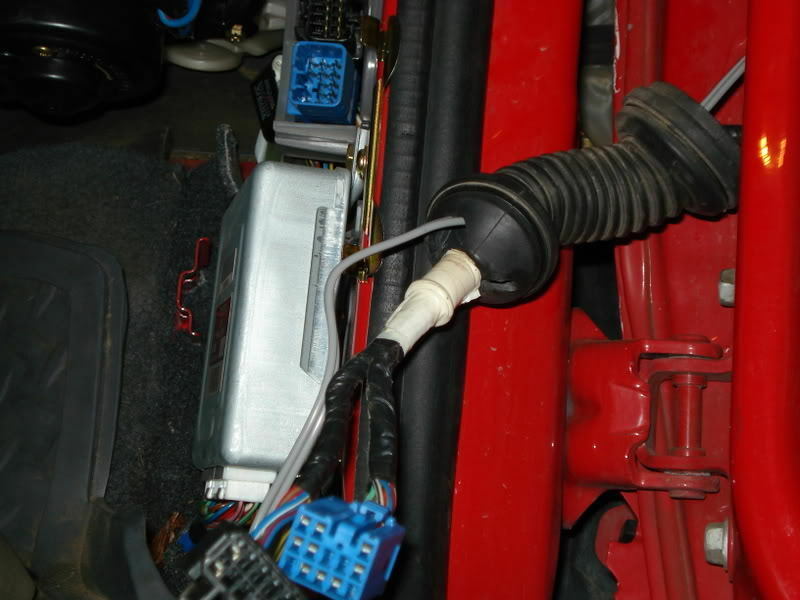 On models with power locks, check the wiring between the door and jamb for damage. Reinstall the door panel when you're done, then test the outside or inside door handle. Figure 1. 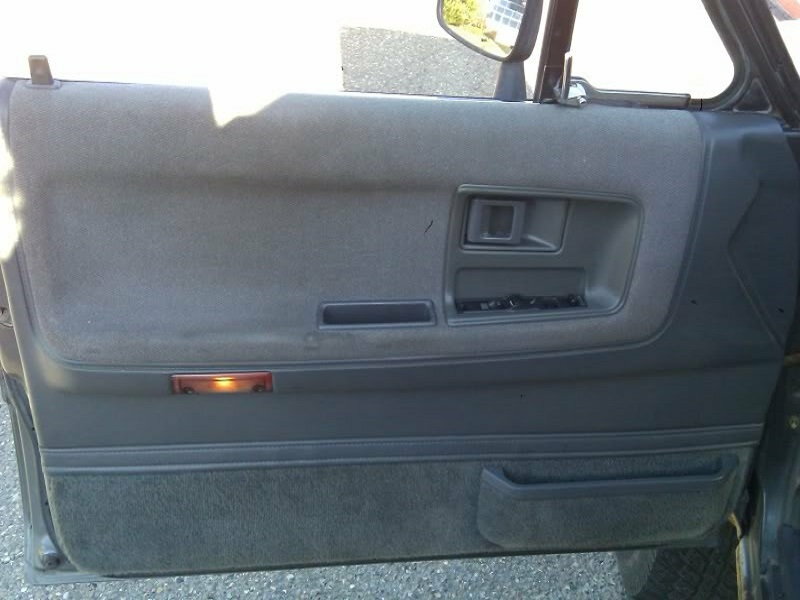 Remove the door panel to access the door handle components. Figure 2. Check the wiring between the door and the jamb. It is also possible that the door hinges have rusted, making it difficult to open the door. Inspect them for damage, lubricating or replacing them as necessary. If the door handle rod is not the problem, go to Step 2. Step 2 – Is the seat belt caught in the door? The problem could be as simple as something caught in the door, obstructing the latch mechanism. If the seat belt hasn't retracted properly and became stuck in the door, you can try wiggling it from inside the vehicle while trying to open the door. If that doesn't work, you will probably require professional help. If nothing appears to be hindering the door, go to Step 3. Step 3 – Are the door locks functioning? If you cannot lock/unlock the door with the key, but the locks function by pressing the buttons, remove the door panel and inspect the lock actuator mechanism. Replace the actuator if necessary, then test the lock. If you cannot lock/unlock the door with the remote but the key works, replace the battery in the remote fob. If you cannot lock/unlock the door with the key, the remote, or the lock buttons inside the vehicle, go to Step 3. On models with power locks, if you can unlock the door with the key but not the remote or inside buttons, check the fuse. 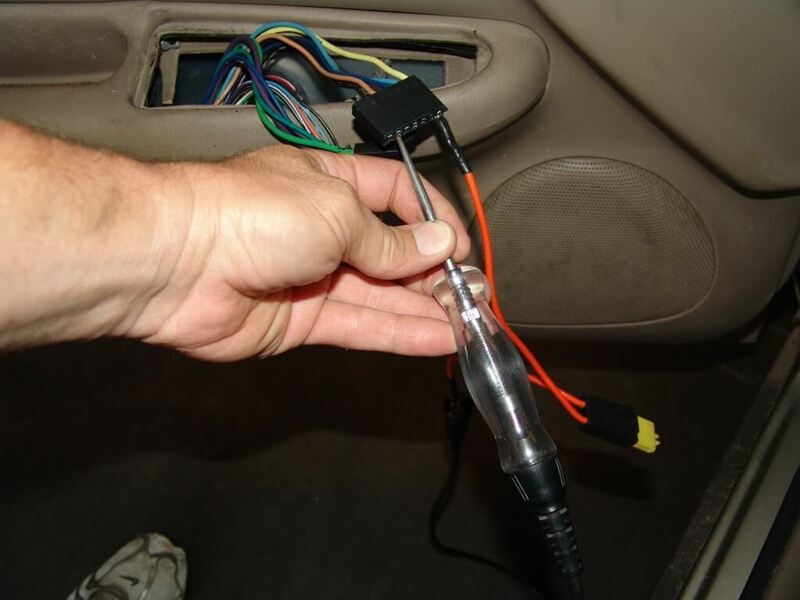 You can also remove the switch panel and use a test light to check for voltage at the switches. If there is no voltage, there may be a break in the wiring. Figure 3. Using a test light to check for voltage. If the door locks are functioning, but you still can't open the door, go to Step 3. Basically, to further troubleshoot the door, you're going to have to remove the door panel. It can be difficult to do with the door stuck shut, but it can be done if you do it carefully, with patience, and the knowledge that a few door panel clips will break. Move the front seat back as far as it will go, and recline the seat back. This will provide you with working room. Remove the armrest and door handle. Use a trim panel tool or flat head screwdriver to pop the clips holding the panel to the door. There will be at least one clip in the upper right corner of the door that you won't be able to access with the door closed. You should be able to pull the door panel out far enough to either break the clip and remove the panel, or just hold the panel out of the way while you reach into the door. Look for anything that has become disconnected, anything broken, or just plain missing. If you can unlatch the door manually, do so now in order to get a better look. If you can't get the door open, you will definitely have to fully remove the panel to perform any repairs. You could have a malfunctioning or stuck door latch. If the door latch mechanism is stuck, it may just need lubrication. If it is otherwise damaged, it should be replaced. The door will need to be removed to perform this repair. Figure 4. You may have to replace the door latch mechanism. If everything inside the door panel is functioning properly, go to Step 5. We recommend having a professional remove the door for you; otherwise, it could be damaged by the tools you use to remove it yourself. If you have done all the checks listed above, and still cannot get your door open, having it diagnosed by a professional is definitely the way to go, even if you decide to tackle any repairs (or straight replacement of the door) yourself.